Believe it or not we are in month number 5 on our kitchen reno. I knew when we started this job, way back in January, that it would take a long time to complete but I honestly thought that by month 6 we would be nearing the finish line. Well, we are nowhere near finishing and frankly, I’m getting tired of the dirty, dusty mess and the inconvenience of having things all over the house, but we can’t stop now. 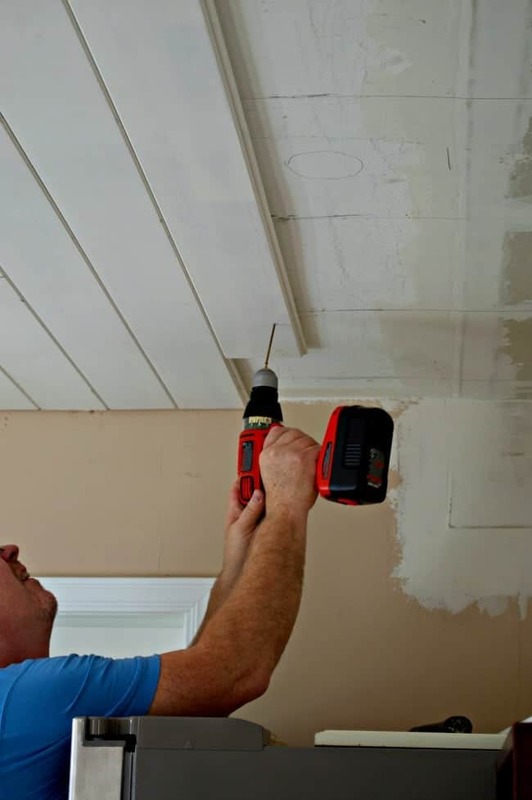 It’s actually been fun doing this reno with the hubs but we’ve reached the point where the most difficult and expensive projects are coming up, which means the stress levels will be rising. The next project will be the build on the extra cabinets that will be an extension to our existing one. I’m not sure how long it will take or what obstacles we’ll hit while doing it, but it will definitely be interesting. We also need to decide what we are going to use for our kitchen countertops. This topic has been debated heavily between the two of us, mainly because it will be our most expensive project in the kitchen and, as I’ve said before, the hubs does not like to spend money. 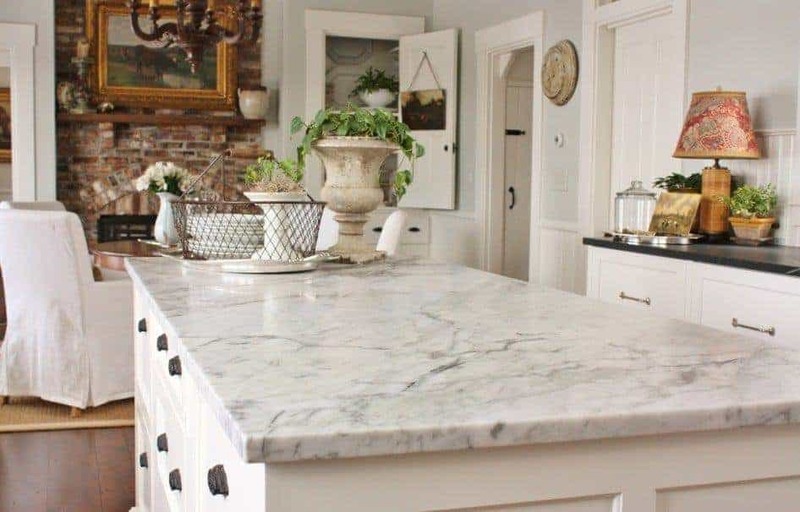 We’ve tossed a lot of ideas around and we’ve researched, shopped and read all we can about different types of countertops but the ones we keep coming back to are concrete, wood and marble. My choice, if I could pick anything and money was no object, would be marble. We’ve had laminate in every single kitchen we’ve ever lived with (10) and it’s something I’ve always wanted. I just love the clean bright color and feel of marble, its timeless natural beauty. I mean, how can you not? The mister’s choice is concrete. His sole reason for his choice is because it’s something that we would do ourselves and it would cost a fraction of what marble would cost. We’ve both done tons of research and read lots of tutorials so I know we could do it and it would look good but…it’s not marble. sigh. Our last choice would be wood. 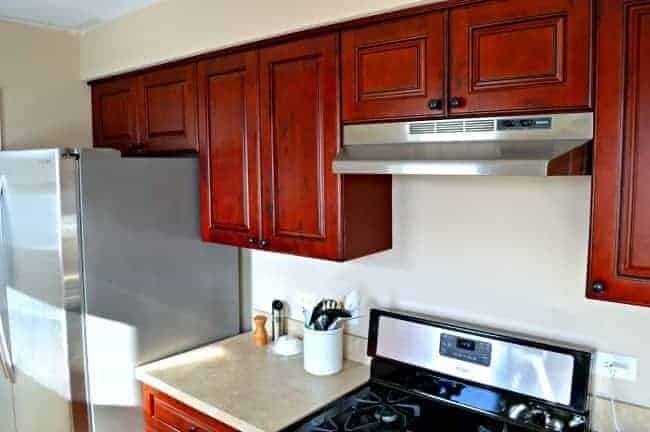 We’ve looked at solid wood countertops at a few places and it wouldn’t be as costly as marble, but it’s not the top of the list for either of us (hubs is nervous about water, staining, etc., I am not sure it suites my style). I think that if we can’t do either of the other 2, wood would win out. So what do you think about our kitchen countertop choices? Do you have any of our picks…can you offer any thoughts or opinions on your own choice? We are hoping to finish up the stove hood build this weekend so I can share it next week. It’s looking so much better than what was there. I hope you have a great holiday weekend and if you are traveling, please be safe. I would vote for granite. I have laminate in my house. But if I could afford granite…that is what I would have. I love the look and the durability. Good luck. Since you like the look of marble why not use Corian? It is a awesome product and can be fixed no matter what you do to it. If it gets damaged just sand down and rebuff.It is hard like marble and you can get all kinds of looks.No it isn’t cheap( but not as expensive as stone)It won’t crack and you can clean it anyway just about you like.It is but so much easier to keep than any of the real stones. Check it out. It has been around now for over 30+ years. I love it. I have considered Corian but it’s never been my favorite material. My husband used to build kitchen cabinets, many moons ago, and he would bring huge samples home after installations to use as cutting boards. There is no doubt though that it is easier to take care of than stone. Thanks though, Wanda. I appreciate you sharing this info on Corian. I would vote for Granite too. My son just put it in their house after much research and it’s great. Thanks for stopping in and for your input Julie. I just got several samples to test in my kitchen but I still haven’t found “the one”. It does help Rue, thanks so much for the input. We looked at the Ikea counters and we really liked the solid wood ones. I would love to see yours s I’m off to check out your post. Thanks Lynne. I so hope that you are able to get the marble that you’ve worked and saved for. 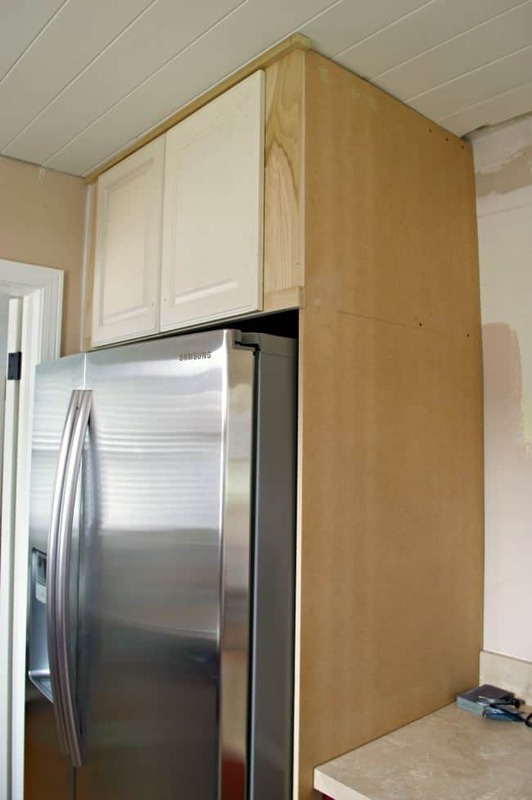 I would love to hear how your remodel goes in your kitchen. Saw your post through Inspire me Tuesday. I personally prefer the marble but understand the downsides of cost and maintenance. 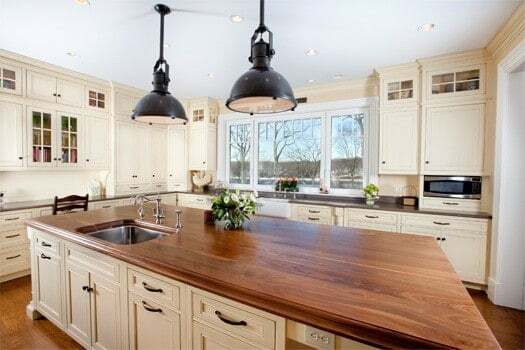 I think wood could be an idea for an island but you should use stone on the rest. I think the concrete will date the house. I had this blogpost saved for myself or alternatives to white marble, I thought it was interesting. Have you considered quartzite or silestone? I have considered quartzite and silestone. I’m not a fan of silestone and I’m still researching quartzite. That was a great post about different materials, very informative. She also shared a part two to the post you recommended. Thanks so much for the info! What a big decision! Since we moved into a house with a large wood island, I thought you might want to hear my experience with it. It has held up very well, surprisingly. There’s no rotting around the sink, and the finish is still holding well. Maybe it has a marine varnish on it? I don’t know, but I love the durability of it, and with our concrete floors, the wood helps add warmth to the room. I personally have never had granite but hope to get it when we redo our counters (hopefully soon!). As for the wooden island, it’s staying! We always consider resale when making decisions. Good luck! It is a big decision Kim. I really appreciate hearing about your experience with a wood countertop. I will definitely fill my husband in on your info, he is the one that is skeptical on using wood around water. Thanks again! I know you said you were tired of laminate, but have you seen the new laminates that look like marble and granite? They are amazing! You really have to look hard to tell they are not the real thing. I like you Kristi have always owned houses with laminate counters. Some have been Like Mary Jean said, “What were they thinking?” counters and some not to bad. I agree the concrete is not your style. I can’t remember if you are painting the cabinets but if not I think the marble is to stark against your cabinets. What ever you chose has upkeep to prevent stains, etc. You have an eye for decorating so go with your own gut feeling. Good luck. I’m still weighing my options Debbie. Unfortunately when you have to worry about cost, your options decrease. Thank you though for your input and I hope that you have a great holiday weekend. I have to say I don’t like concrete. I think about down the line, when people will say, “what were they thinking!” And it’s so permanent! You know me, I love to change. I think the suggestion of granite might be a good choice. You could probably get something that is clean and bright. I’ve never had marble, but if what they say is true about it, I don’t want it. When we moved into our house, the counter top in the bathroom was laminated, but it had a raised surface to it and it had already gotten soap scum in the grooves. Needless to say that went bye-bye real fast! I know what you mean MJ. We have had that very conversation about concrete. Oh my, raised surface laminate…I would have gotten rid of it quick too. Thanks for weighing in MJ and hope you have a great weekend. Decisions, decisions! I have marble in my bathroom and it’s so porous, it soaks in every single thing that lands on it. If you like that imperfect look, then it’s a good, albeit expensive, choice. I always wanted wood. I love the look, but the cost for mahogany at the time was prohibitive and yes, like marble, it’s not always the most durable. Hmm. I wish you luck! Thanks Kim I appreciate the input. I also looked into quartz but it is very expensive and it has it’s flaws too. I guess there’s no perfect material out there. We have granite that was added when we updated our kitchen a few years ago. I love the look of marble, but not the upkeep. Granite is so easy and you can set a hot pot directly on it and it won’t stain. I love the look of wood, too, but then there is the upkeep again. I like the look of concrete, but not sure how good it is for resale. I like granite too. We had it in a bathroom in FL and I loved the feel of it but it was really busy for my taste. I agree with you about concrete and resale. That is my main concern about using it because we will more than likely sell our house in a few years and I worry how potential buyers will feel about it. Thanks for your input Kim.